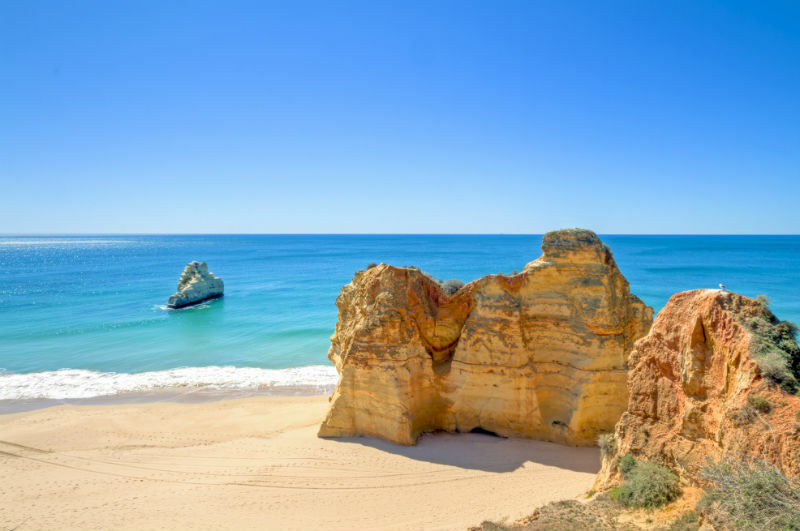 Praia da Rocha sprawls out along Portugal’s Algarve coast and is now one of Europe’s most popular holiday destinations. A land of glorious beaches, purpose-built hotels and restaurants, it is second only to Albufeira in tourist numbers. Known mostly for its splendid sea, sand, sun and sangria, there’s also a wealth of history and intrigue just waiting to be discovered. Dive amid wrecks of sunken ships; browse in the museum; learn about Praia da Rocha’s proud sardine industry; visit a fort or go to the theatre – culture is everywhere you look, bathed in sunshine. If you get tired of basking on the sun bed all day, Praia da Rocha has plenty of other things to do. So roll up your towel, top up the sunscreen and get exploring the area’s greatest attractions. This four hour journey of discovery begins with a jeep ride taking you over rugged terrain to some of the hidden beauty spots of the area. Hold on tight as your guide takes you on a memorable off-road trip before pulling in at the marina. From here you’ll be taken by motor boat to explore the wonderful caves gouged into Praia de Rocha’s rocky coastline. Be prepared for a thrilling tour and don’t worry about the adventure element – this excursion can be taken by just about anyone, regardless of age or fitness. Portimao Theatre boasts an impressive and diverse calendar of performances. No matter what time of year you visit, you should find something of interest, be it ballet, drama, pantomimes or music. Small ensembles also appear regularly, including jazz bands and string quartets. Drama performances are often played in Portuguese but can sometimes be staged in English too, giving you the choice on how you’d like to experience the theatre. If you fancy a round or two of golf, you will be spoilt for choice. There are 14 golf courses near Praia da Rocha, the closest ones to Portimão being Alto Golf and Country Club and Gramacho, both of which are premier 18-hole courses. Alto Golf & Country Club was designed by the legendary Sir Henry Cotton and offers beautifully landscaped, winding fairways, backed by villas, apartments and townhouses, many with superb views over the greens to the sea. Meanwhile, at Gramacho, Ronald Fream teamed up with the former world Number 1, Nick Price, to create stunning greens accented with historical dry stone walling, ancient trees and artistically sculpted lakes and bunkers. The course has 27 greens and a wide variety of tee points. This incredible 15th century fort proudly dominates the coastline and is a sight to behold as you sunbathe on the beaches at Grande and Angrinha. This structure was originally part of the ancient defence system for the area and has been lovingly restored and preserved. However, it is not open to the public, so best observed from afar. But if you want to get nearer for an alternative view, take one of the lovely hilltop walks leading to some steps which take you down to the fort. You’ll be rewarded with some great photo opportunities. If there’s one thing the people of Portimao are proud of, it’s their sardine industry. The museum focuses on the importance of sardines in the area and is even situated in the old sardine factory. You can go on a factory tour and view an informative video, pictures and reconstructions of life in the factory. The museum also provides temporary exhibits, in addition to some interesting Roman and Moorish artefacts from the area, perfect for an insight into the history and life of Praia de Rocha and Portimao. The devastating earthquake that shook the area in 1755 spared little, but the Church of Our Lady of the Conception is one of very few buildings that managed to survive. The main building dates back to the 17th century, while the front of the church retains its original 14th century façade. The church’s beautiful whitewashed exterior masks a panelled interior featuring a stunning gilded altarpiece. This charming church contains a wealth of history and is one of the few buildings in the area to hold memories of the past. The diving school at Praia da Rocha is perfectly placed for wreck diving. The ships that sank here played key roles in the Portuguese navy and offer insight into the history of this area’s shoreline. For divers, these ghost ships are fascinating to get close to underwater and their nearness to one another makes it all seem rather like a diving-style theme park! Don’t worry if you are a novice: the school also offers beginners lessons. This is fantastic diving in interesting waters, for all diving abilities. As one of the Algarve’s most lively holiday locations, Praia da Rocha’s nightlife positively pulsates with bars and nightclubs on the main strip. Before heading to the nightclubs (notably Babylon and Katederal) after midnight, you’ll find many top class restaurants, mostly offering international menus and fusion food. If you prefer to keep it traditional, places like Humberto’s Restaurant serve succulent steaks, Portuguese tapas, seafood and fine Portuguese wines. Stroll out after you’ve eaten and you’ll find every kind of bar you can think of, from bustling Irish bars, sports bars and live music bars to more relaxed cocktail bars and lounge bars.